The Moonlodge is many things, but most of all it is a magical womb-an’s space, a sacred temple of the goddess, used for personal retreats, women’s circles and rituals. 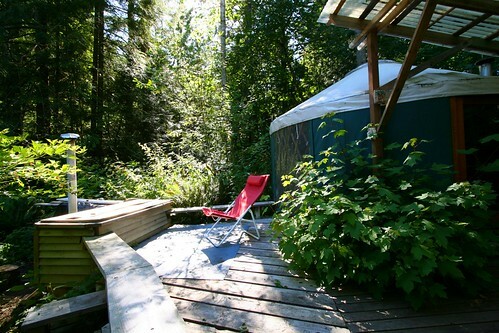 Most simply, it is a sweet round yurt tucked into a secluded woods setting, accessible by a short trail from a dead-end dirt road. Many women have used it as sacred space during their monthly moon-time, for rites of passage, to honor transition points in their lives. The Moonlodge offers a place to learn about feminine rhythms, innate feminine wisdom and the healing power of women’s circles, either in private solo retreats or in groups. The Moonlodge is rustic: it is heated with a woodstove (firewood provided) and is basically a “tent” so there is minimal insulation. Once the fire goes out, it is as cold inside as it is outside. 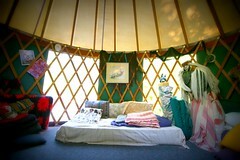 Cars cannot drive right up to the yurt; supplies must be carried or wheelbarrowed about 100 yards down a hill by foot-path. Amentities: electricity for lights and stereo (provided), carpeted, two mattresses for sleeping, simple kitchen supplies and a propane camp-stove on the porch for cooking. It is totally private and secluded, surrounded by trees. Generally women who reserve the Moonlodge are there for private retreat, and are comfortable with the minimalist outdoor kitchen set-up on the porch and outdoor compost toilet. 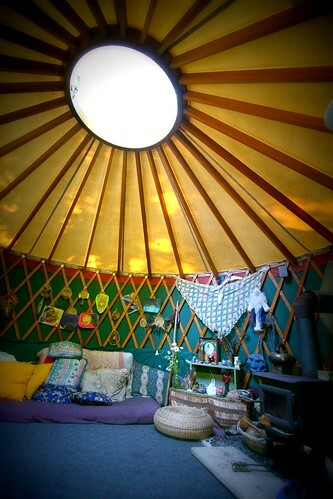 Those who want showers and more creature comforts are encouraged to stay in one of our cabin-yurts near the Round House. The Moonlodge is only available to women who are familiar with woodstoves, except in summer when heat is not needed.